Jeff Bridgers is a local modern blacksmith in Wilmington, North Carolina. An amazing artisan whose independence and dedication to his craft shows in the quality products he produces. Jeff’s creations are all hand made from the art he forges to the grooming products, handcrafted knives, and razors he makes. You’ll get a better sense of what I’m talking about by taking a quick look on his website. His video explains who he is and what he stands for. An impressive individual. About two weeks ago, I requested a few samples of his shaving products for review. 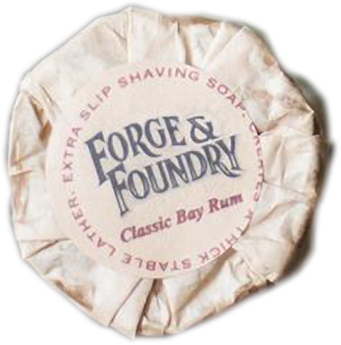 First, we have the Classic Bay Rum 4oz puck of shaving soap wrapped in tissue paper with stick-on labels sealing the front and back of the product. On the front label, it reads “Extra Slip Shaving Soap, Creates A Thick Stable Lather” and both of these statements are true. On the back, a very brief how to and the soap ingredients. Next, we have a pre-shave scrub and aftershave with the aftershave in the same classic bay rum scent. The classic bay rum scent is pleasingly on the strong side. The pre-shave scrub has its own scent which I really like. This face scrub happened to be a big surprise. I’m not one to use many of them but I will reach for this often. I feel it really helped to add more glide for the razor and I like the way my face felt after using it too. The only negative was the aftershave stickiness. I was not too fond of the feeling but again it did feel like it added a little extra to a great post shave feel. I bowl lather and found this soap to be great for doing just that. It was easy to apply and it only took a little over a minute to create this amazing mound of lather my brush was covered completely with it. As I started to lather my face I could feel the foam starting to change getting real creamy. As I continued it then turned into nothing but a creamy thick lather which really got into my 5-day old beard. The slickness and glide were perfect allowing me to go over the trouble spots many times. I'm sure the pre-shave had something to do with it too but this soap could hold its own just as well. My post shave feel was truly one to remember. So, I had a great shave with Forge & Foundry and all of Jeff's research to create a great product absolutely shows in its performance. Please take a look at the website he's way more than just a soap artisan.